Planning anniversary music for a memorable party is easy. We’re not limited to the list of exclusively contemporary music in the above link. Instead, we planners have several “built-in” landmarks. For example, we know the year the happy couple got married, and we know how many years ago that was. So we can search for songs that were popular that year, and we can search for song titles and lyrics that contain that anniversary number. In addition, most cultures have traditional wedding anniversary music. With a little creativity, we can tap these traditions according to the couple’s family backgrounds, where they met, or where they’ve lived or visited. Of course, when we help anyone plan their party’s anniversary music, we rely on a few tips that apply to planning music for any party. Let me describe some of my favorites. First, early in every planning conversation I ask the couple, “What’s your favorite music?” — songs, artists, bands, instruments, eras, and styles. Do you enjoy dancing? Singing? Their favorites often include sentimental songs from their courtship days, wedding reception, and other personal landmarks. Their favorites also might include songs with their names in the title or lyrics. I recall one wedding processional when the bride named Wendy asked us to play “Windy” (recorded by The Association back in 1967. Remember that one?). I bet she’ll include the same song in her party’s anniversary music some day. How about YOU? Have you ever helped anyone plan their anniversary party’s music? Tell me your favorite part. Other than my own wedding- and catering hall operations for 7 years- I’ve only hired musicians thrice for private (small) parties. We provided a series of about 10 to 12 pieces that they knew they were to perform (well); the rest was up to them. Of course, we knew their reputations and capabilities- and they didn’t disappoint. Thanks for commenting, Roy. Sounds like you arranged the music nicely. It would be wonderful if everyone could organize so well. And I’m glad the musicians didn’t disappoint, as you say. Makes all of us look even better. What kind of parties were these? Birthday? Business? Anniversary? Thanks, Sarah. 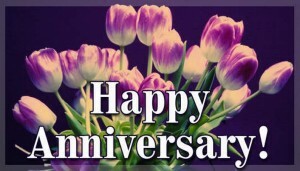 Thanks for commenting and CONGRATULATIONS on your anniversary. I’m glad you like these tips — they’re bound to come in handy one of these days. Next post: Wedding School – for Planners and Their Associates?